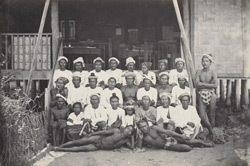 Photograph of a group of Burmese men in Burma (Myanmar), taken by J. Jackson in c.1868, part of an album of 43 views of Burma from the Sladen Collection. They are posed on the pathway in front of a house and wear traditional Burmese dress including headwraps and checked loin cloths. The photographer, Jackson, is known for his interest in documenting Burmese life including ethnographic studies such as this view. The location is unspecified, but may possibly be Mandalay, Burma’s last royal capital founded in 1857. The image is from an album formerly in the collection of Sir Edward Bosc Sladen (1827-1890), who was sent to Mandalay as Agent to the Chief Commissioner in 1866, and in 1885 accompanied the military force against King Thibaw which resulted in the king’s exile and the British annexation of Mandalay.